If you plan to replicate VMs running applications that do not support VSS, you can instruct Veeam Backup & Replication to run custom pre-freeze and post-thaw scripts for these VMs. The pre-freeze script quiesces the VM file system and application data to bring the VM to a consistent state before Veeam Backup & Replication triggers a VM snapshot. After the VM snapshot is created, the post-thaw script brings the VM and applications to their initial state. At the Guest Processing step, click Applications. Select Require successful script execution if you want Veeam Backup & Replication to stop the replication process if the script fails. Select Ignore script execution failures if you want to continue the replication process even if script errors occur. 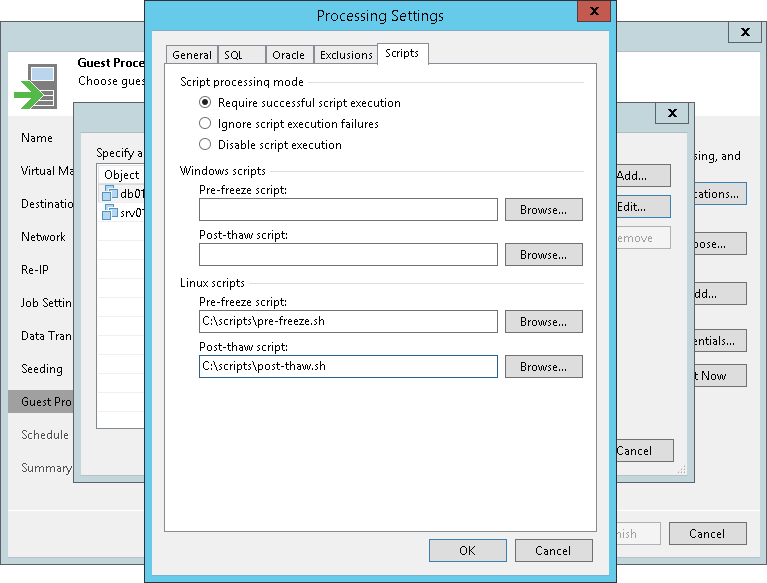 Select Disable script execution if you do not want to run scripts for the VM. In the Windows scripts section, specify paths to pre-freeze and post-thaw scripts for Microsoft Windows VMs. Veeam Backup & Replication supports scripts in the EXE, BAT and CMD format. In the Linux scripts section, specify paths to pre-freeze and/or post-thaw scripts for Linux VMs. Veeam Backup & Replication supports scripts of the SH file type. If you have added to the job a VM container with Microsoft Windows and Linux VMs, you can select to execute both Microsoft Windows and Linux scripts for the VM container. When the job starts, Veeam Backup & Replication will automatically determine what OS type is installed on the VM and apply corresponding scripts to quiesce this VM. Beside pre-freeze and post-thaw scripts for VM quiescence, you can instruct Veeam Backup & Replication to run custom scripts before the job starts and after the job completes. For more information, see Advanced Settings.